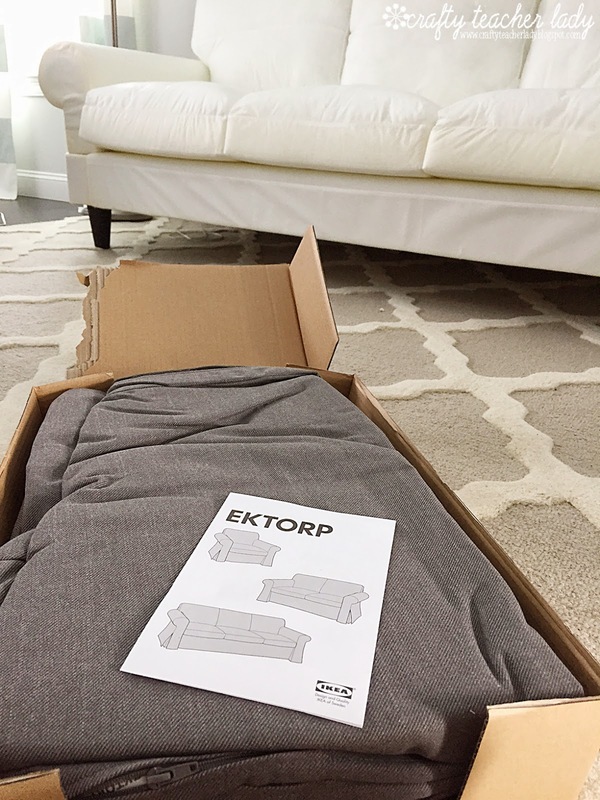 I recently took a little road trip down IKEA (the nearest being 2 hours away) to pick up a second EKTORP sofa! I purchased my first Ektorp two years ago and really love it. In that time I've been asked about the sofa by lots of friends, both online and in real life, so I'm here to give a comprehensive review of my experiences. The EKTORP series offers a full size sofa, loveseat, arm chair, footstool, and sectional options. I've owned the sofa, footstool, and until recently, two armchairs (which I sold in order to make room for another full size sofa). 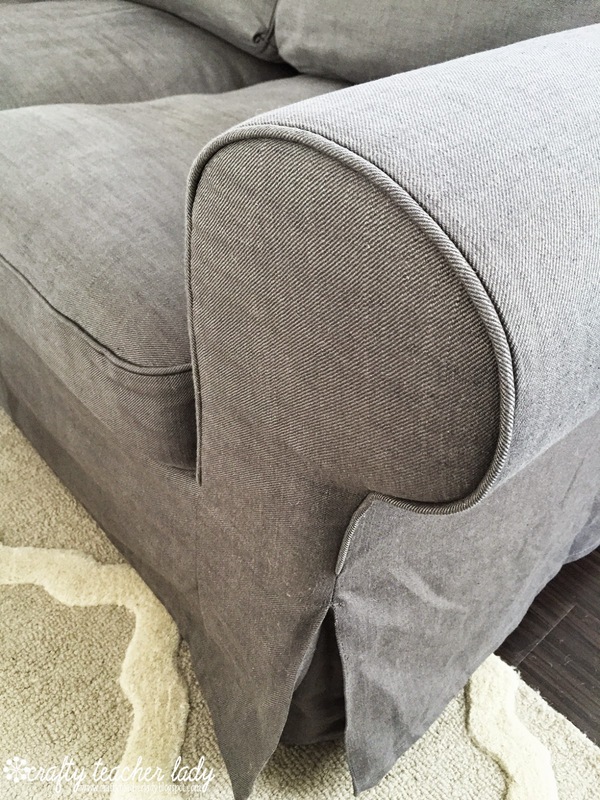 Each piece of furniture is purchased separately from the slipcovers, allowing you to easily change out the look as well as remove the slipcovers to wash when needed. I haven't had to wash mine yet but I've read lots of other reviews from people who have and say it's quite easy. The slipcovers vary in price depending on the color and material you choose. For the combination I chose I paid $499 for each sofa (without tax). 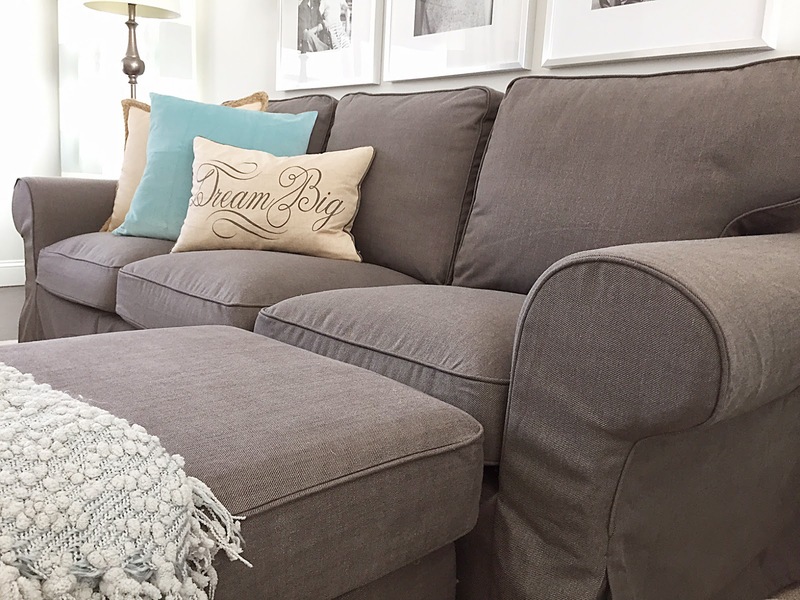 I chose 'Nordvalla Gray' for my slipcovers because it's dark enough to hide everyday stains and I just really love the color gray! 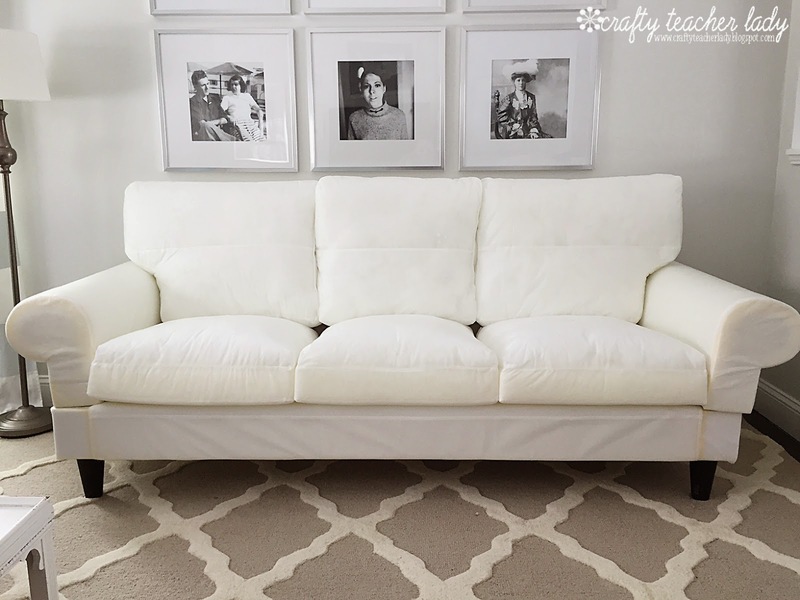 My second choice is the basic white, which I've read is really easily laundered, and this is the least expensive of the slipcover options. What I really like about the slipcovers in addition to their washability, is that they don't look like your typical slipcovers. 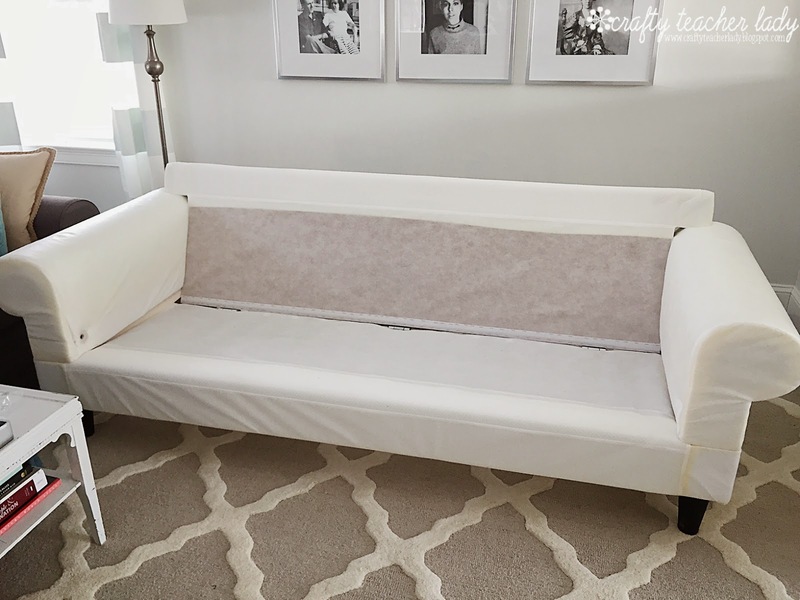 They are tailored very nicely with a piping detail so they fit the couch frames perfectly. In fact, most people don't even realize they are slipcovers when viewing the set in person. The Nordvalla gray cover is a very thick material, almost denim like, not as soft as the white slipcovers but very durable. The arms of my older sofa don't have any pilling yet, but I would imagine over a longer period of time they might. Also, it's important to note that I don't have any kids or pets jumping on my sofas (other than the occasional visit from friends) every day so my furniture is gently used. However, in all of my research on this series before purchasing, I read countless reviews of people with kids and pets who raved about the durability/washability. For further comparison purposes, in the photo above, the sofa on the left is the older one and the one on the right is the brand new sofa. 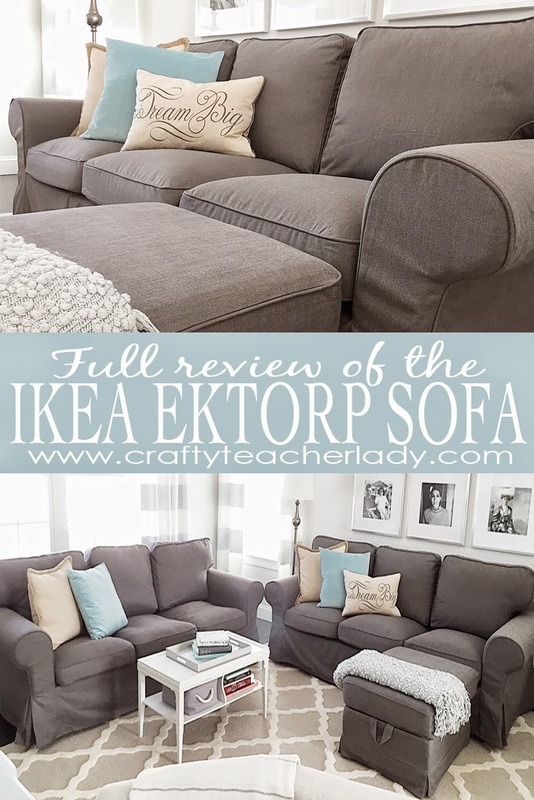 I combined two of the Ektorp sofas in addition to an Ektorp footstool to form my own 'sectional'! I get compliments on the sofas very often from guests visiting my home and many are surprised to learn they are from IKEA! They are comfortable to sit on, not too firm, not too soft. Overall, I highly recommend this affordable, durable, and good-looking furniture set! I have the same sofa and about the same age. I recently re-stuffed my seat cushions using fiberfill. I purchased one bag for each cushion. If you unzip the interior cover and carefully separate the old stuffing from the foam (don't remove it though) you can then put the new stuffing in between. Zip it back up and put the outside cover back on and the cushions are just as fluffy as new. What a great idea! Thanks for the tip! Oh that's great to hear! Hope you are enjoying your lounge time on your new sofa! I just stumbled upon this and wanted to let you know my experience with the Ektorp. 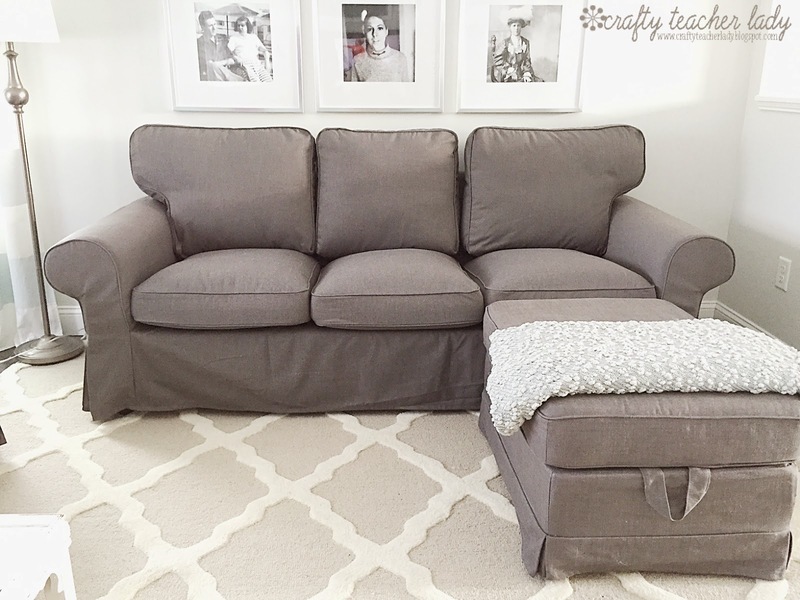 I purchased a 3 cushion sofa, a 2 cushion love seat and 1 ottoman back in 2010. I bought the creamy white slip covers wich was a real leap for me. My children had just left for college, so I bravely went with white. Boy! I can't tell you how much we love this furniture! It is everything you posted and now at 5yrs. it still looks great!. When I bought them, the sales lady at IKEA told me to Scotch Guard the covers. I did, and we have spilled red wine & soy sauce to name the worst and everytime with the treatment of Shout, they come out looking like new! I live in Nor. Cal. and have short Winters, so I do bright pillows, and throws along with colorful bambo rugs. Last week I switched into Fall mode and replaced the brights with Grey, Cream, Rust, Tan and Black accents! We love it! Awesome! I'm thinking of getting the white slip covers, too, as a way to switch things up and change the look of my room! That's the beauty of this set! Thanks for reading!! I love to see what you have done! I love IKEA! 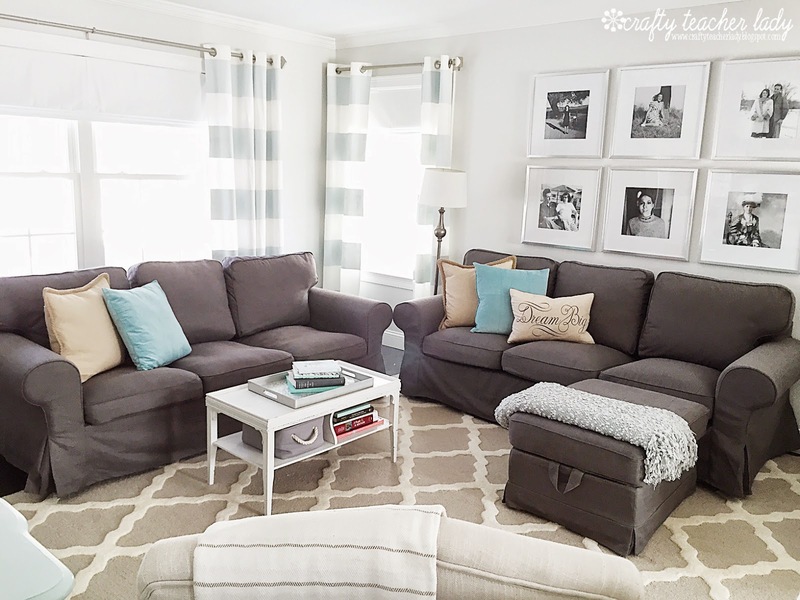 I love to see how other people put rooms together, but just can't do it myself! I have a great/ living room, with two recliners, misc musical instruments and a weaving loom. I simply put up chairs for company. I sold my old couch(there was no way to save cushions from ripping) but I would like to have one again. I need your help! 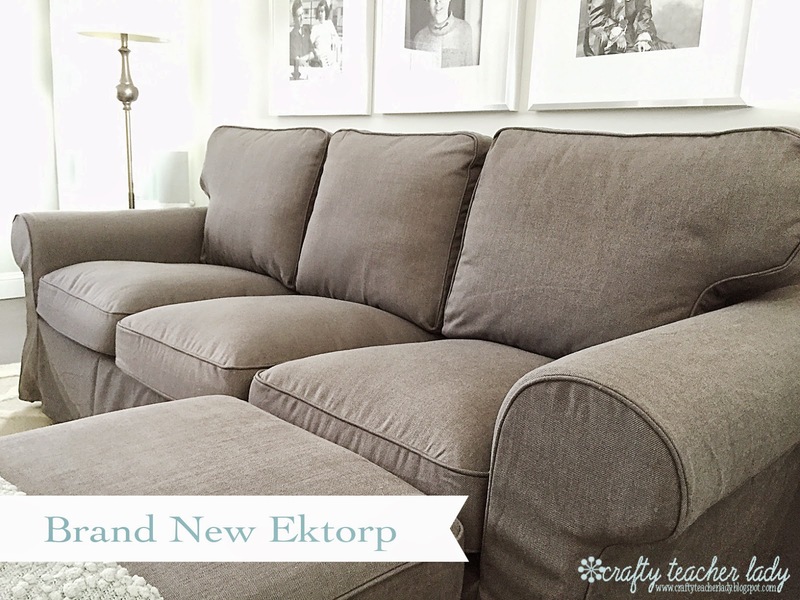 This review makes me so excited as I just scored two Ektorp love seats for $250 each-and they're practically new! Can't wait to enjoy them in my house!! Thanks for the insight and great review! Wow! Awesome deal!! Totally jealous! Ha! Thank you so much for posting this review. I have been pondering about this sofa for several years now. I think I will finally be able to purchase it within the next year (finally convinced my husband to move the brown leather couch out! to another room of course.) I think I'll go to the IKEA website ad get the measurements right now. Thanks again for the in depth review. Oh you're welcome!! Good luck and have fun with your purchase! I love IKEA!! I was looking at the same Ikea sofa but with the chaise attatched. I see you have just purchased the matching ottoman and placed it in front to make a temporary chaise. What a great idea, then you can move it around the room as you please. 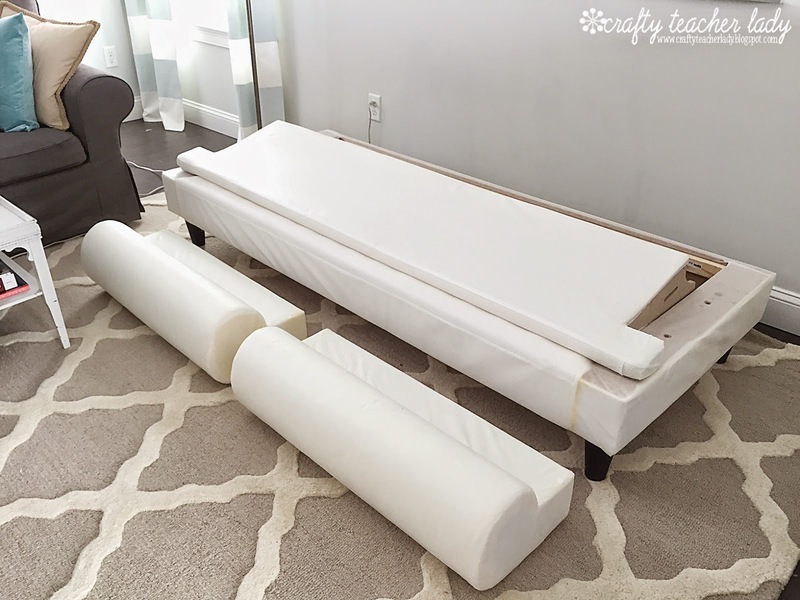 I will have to measure now to see if the ottoman idea will work in my living room.....thanks! Yes! I love being able to move the ottoman around, especially when entertaining and in need of additional seating! Thanks for visiting! Gotta love IKEA furniture and all the assembly required! Ha! Do you sink in on couch and hard to get up out of? This is beautiful. Where is your floor lamp from? Thanks. Thank you! The lamp is from Walmart but purchased about 10 years ago when I moved into my very first apartment! For the price, I do find these couches comfy! But, I'm sure it's a matter of personal preference! Luckily, I was able to test them out on the IKEA showroom before purchasing! I've seen the newer generation sofas and they do seem smaller. My cusions are the style with the two foam pieces. My sofa although older still looks great! Just wondering if anyone else has had the older sofa and the new slipcovers would fit on it and if they have fixed the shrinking problem. Thank you! 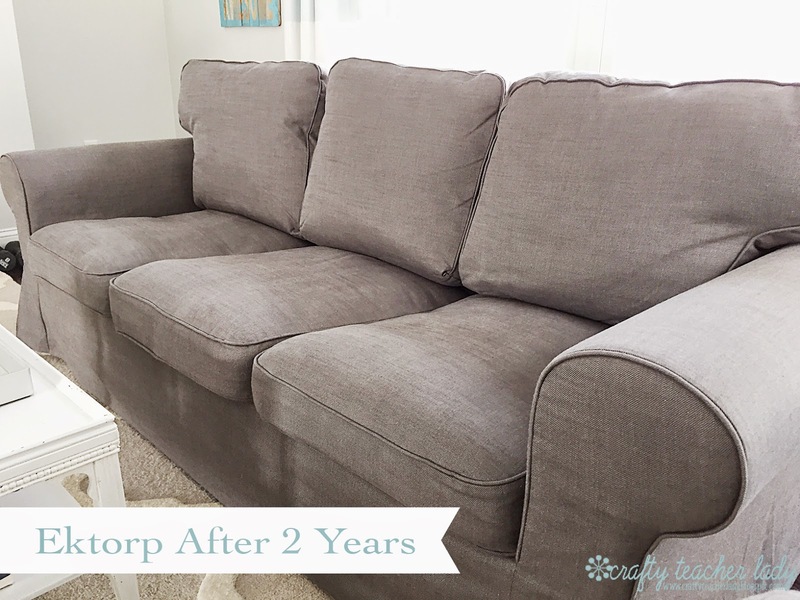 I bought an ektorp three-seat sofá last year and i washed the covers last month at 30 degrees. I ironed them and they didn't shrink. 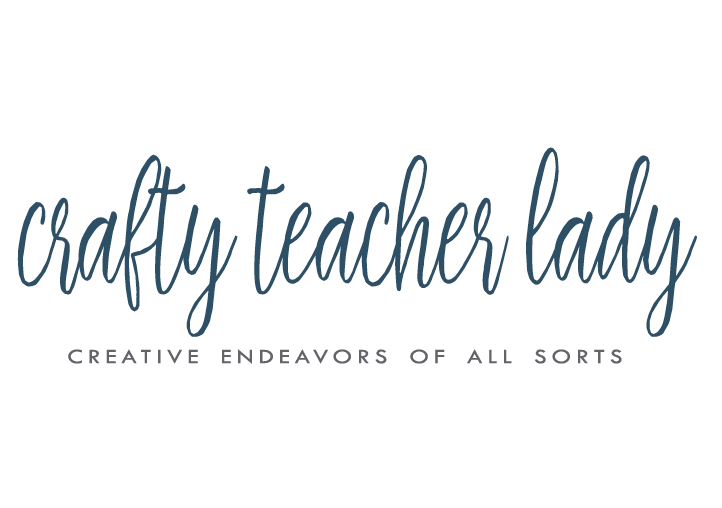 Thanks Crafty Teacher Lady, I was on the fence about purchasing this sofa, but not any longer. 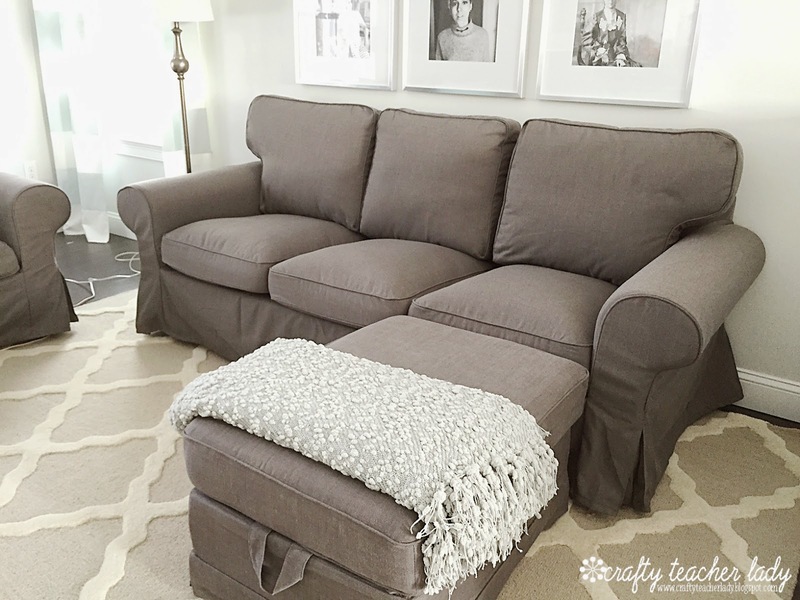 Once my taxes come in, my kids and I are finally getting a new sofa! Thanks again well written and in depth review. Your reviews sold me on getting this as my new sofa! Thanks!! We have purchase several off craigslist in preparation for sending kiddos out into the world after college and and have been more than happy. If you live near a store always check the "scratch and dent" section. Have found amazing bargins on covers. 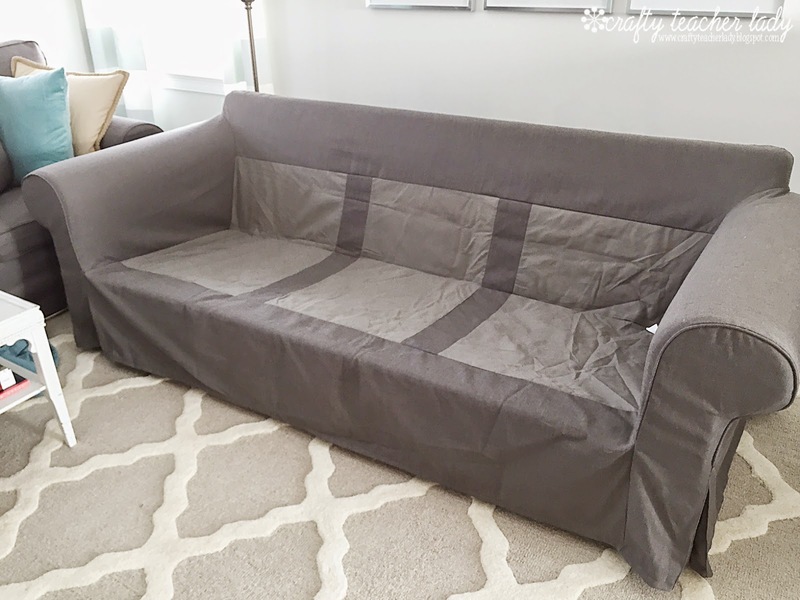 I used to have the Ektorp sofas and chairs in white, and bleached and washed them all of the time.I could even put them in the dryer on low.I also had the ottoman in gray and wanted to warn everyone not to dry the gray-it will shrink.I wound up using the shrunken cover on my dogs bed.It hasn't been washed in waaaaay to long and still hides dirt, stains and has made me realize that I want the Ektorp set in gray(I gave away my old set for the Kivik, which I loved, but the slipcover material was different than Ektorp and didn't hold up as well.I had gotten the light gray and it pilled, while my old gray ottoman cover hasn't pilled in years...Thanks for the review.Your room is beautiful! I just went to Ikea yesterday for the first time and was impressed and overwhelmed at all of the options available for comfortable and down to Earth living styles. After reading this review, I will definitely consider buying my next living room set from Ikea. I especially love that I can change the slip covers when I'm ready for a new look. Thank you so much for an in-depth review of your sofa. True, but they now have a new grey called Nordvalla Dark Grey it's available in the stores now and will be up on the website in a couple of weeks they told me today. Did you have it delivered, or did you bring it in to your home yourself? I'm wondering because I like the Ektorp, but I've heard some negative things about IKEA delivery, and I was wondering how difficult it would be for me to bring this in alone, myself, with a dolly. I brought it into my home with the help of a friend! You might be able to do it yourself with a dolly but I'd recommend having someone help with the lifting. Once in the house, I assembled and moved the couches around myself! Good luck! Hey! 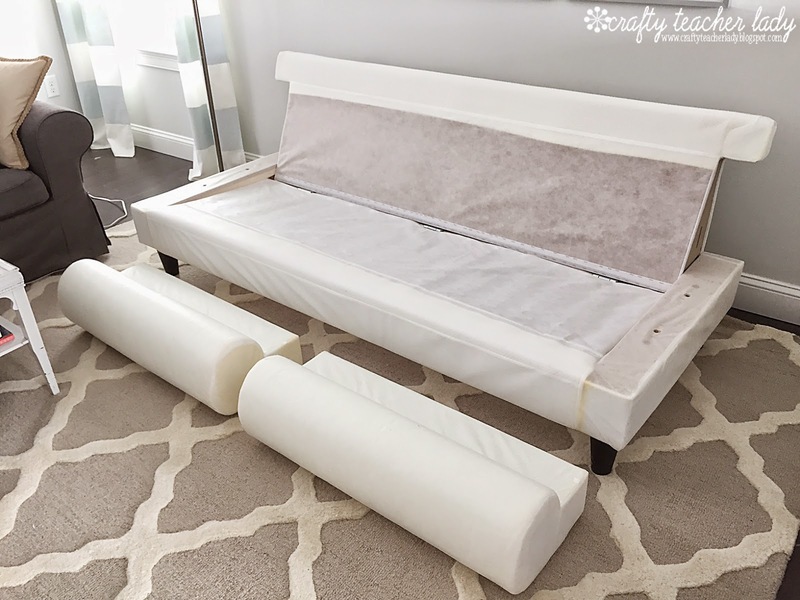 Love this idea to add the ottoman to act as the chaise lounge! Do you think it's the same deminsions as if you actually got the couch with the chaise attached? I'm not sure of the exact dimensions of the chaise but I'd guess it's probably similar to adding the ottoman! It's nice to have the flexibility! Thank you SO much doing this review!! Your home is BEAUTIFUL! I just LOVE the look you have created! I'm also super excited to read this because I ordered an Ektorp sectional, chair & ottoman plus their square Hemnes coffee table that are being delivered tomorrow!! 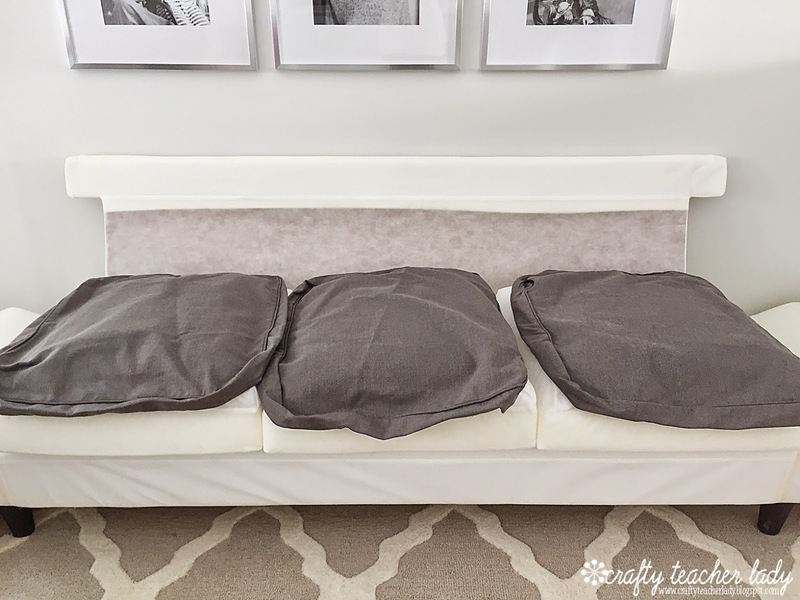 We choose the white slip cover & I too have read good things about the durability and washability of the white slip cover from people with kids & dogs, which we have both of! So thank you again for sharing & for being so descriptive!! What is the frame made of? Is it wood, does it have springs? Hi! Love this review! I was wondering what type of support there was under the seat cushions. I didn't know if there were springs, or wood, or maybe nothing at all :) I checked the website and couldn't tell by their description. Thanks!! These sofas look so adorable. Thanks for posting this review. The idea to add the ottoman to act as the chaise lounge was brilliant. I have a small home, abot 700 sqf, I want to buy a sofa like your but I dont know if it would fit my living room? I found that to get the monster Ektorp sofa box from Ikea, it had to be first unboxed to fit in my Honda Element, then from the garage with 11 ft ceilings, I had to remove the back section (6 screws), it was then manageable for one person to carry up the stairs, to the LR above, and move around. After assembly it really requires 2 persons to move it, so make sure you assemble it in the spot where used. It was worth it -dark grey. Ordered mine a couple days ago with white and also ordered a grey slipcover. IKEA now delivers to my city for only $20.00. So the only concern is if it'll fit in my van. 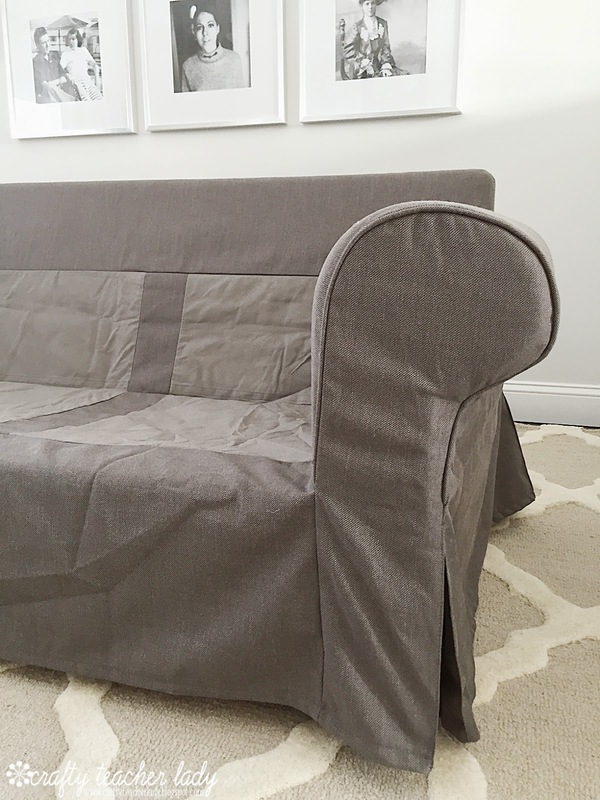 Has any one purchased slip covers for their Ikea Ektorp from a different company? I have run across a fewoptions from my web search. . . .I want to purchase the sofa but want a navy color slipcover; which I've found just not at Ikea.